One of the most spectacular sights in Cabo San Lucas are the enormous grey whales frolicking around with their calves. Every winter, the grey, blue, and humpback whales migrate 6000 miles from Alaska to the warm and shallow waters of Baja California in order to mate and birth their young. Spotting the magnificent creatures, that can grow up to 100 feet in length and reach 120 tons in weight, is an awe-inspiring gift from mother nature. If you visit Los Cabos between December and March, you are likely to have numerous encounters with 50 foot grey and blue whales that will get up close to the boats and show off their tricks. From coming up for a breath and spouting to signify their presence to a full body breach where the whale rockets out of the water, a close encounter with these animals is something everyone needs to experience. Baja California is their vacation destination even more than it is yours but you both can enjoy the ocean together. 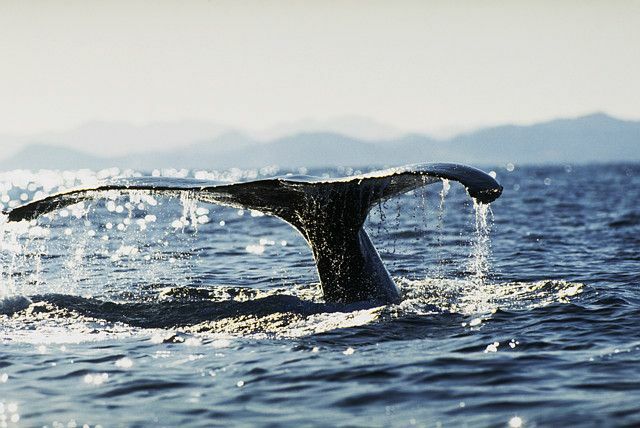 Baja is home to two world heritage sites that protect the whales and the surrounding environment. This makes it a perfect breeding ground for the beautiful mammals and an even better whale watching destination for vacationers. There are numerous tour companies who offer whale watching tours and they are not all the same. You can opt for a basic tour on a panga out in the Cabo San Lucas bay or experience the ultimate whale watching by taking a short flight up to Magdelena Bay where the mating happens. There is something for everyone when it comes to whale watching in Cabo San Lucas and it all depends on your available time and budget. You can get a glimpse into the life of the giant sea creatures for as little as $45 or as much as a few hundred bucks. As long as you head out on a tour from late December through March, you are almost guaranteed to see some amazing whales enjoying the Sea of Cortez and Pacific Ocean. Although grey whales are often the main attraction because of their 6,000 miles migration to birth their calves, you might spot several other amazing species during a whale watching tour. Humpback whales, blue whales, sperm whales, finback whales, minke whales, orcas, and bottlenose dolphins also love to swim in these waters. When the water is clear, you can also spot giant manta rays and sting rays below the surface. Whales watching can be great for up to five months a year, from December through April. Every year can be slightly different, and whales can show up as early as late November or as late as early January. To guarantee you witness the magnificent creatures, plan your vacation somewhere between January-March. These months see the most whale activity, especially in the Sea of Cortez and Cabo San Lucas Bay. December is almost always a good month for whale watching, but many of the grey whales are still birthing their calves farther up the coast and haven’t made it to Los Cabos yet. Although you don’t need any special equipment to watch grey whales frolicking around in the warm waters of Baja California, there are a few suggested items to make your trip enjoyable. If you plan on getting up close and personal with whales, a waterproof camera is a good idea just to play it safe. You don’t want to lose all your Cabo pictures just because a whale nudged your boat or breached nearby. You also want to bring plenty of sunscreen and sunglasses. Cabo San Lucas almost always sunny and the light reflecting off the water will burn your skin quickly and be hard to stare at without glasses. If your trip is leaving early in the morning, the temperatures will be a bit cool so you should bring shoes (that you don’t mind getting wet), pants, and a jacket. Last but not least, do not forget to take sea sickness pills 30 minutes to one hour prior to your trip so you don’t ruin it for everyone. Buccaneer Los Cabos - Kraken Tour: A popular pirate themed tour searching for the Kraken monster (and whales). Cabo Adventures: The leading tour company in Cabo San Lucas has a whale watching photo tour for $85/adult and $59/child. Cabo Eco Tours: By far one of the lowest cost whale watching tours in the Cabo San Lucas area. Tours start at $21 for an adult and $15 for children. Cabo Expeditions: A 2.5 hour tour for $85/adult and $55/children ages 5-10. Cabo Rey: A luxury yacht that takes you out into the bay for a night of hors d’oeuvres, open bar, and whale watching. $49/person and 50% off for kids under 12 years old. Gratuity and $15 peso dock fee not included. Cabo Sails: Private luxury sail boat tours with snacks and open bar included during the 2.5-3 hour adventure. Price is determined by size of boat and number of people on the tour. Cabo Sailing: Shared or private tours available. Shared tours cost $64/adult and $32/child and includes snacks, open bar, and snorkeling gear. Cabo San Lucas Tours: Low cost whale watching tours with many different options. Esperanzas Tours: Another popular whale watching tour guide that will also show you around the city and take you out on a glass bottom boat. Ocean Riders: $75/adult and $55/child for a 2 hour tour around the Cabo corridor. Private charters are also available. Oceanus Los Cabos: A unique tour company that also offers minisub dive tours. Panchito Tours: (site down) Another company offering long day trips up to Magdalena Bay for $209/person. Scurvy Dawg: A great pirate themed adventure on the seas searching for whales. $39/adult and $20/child. Sunrider Adventure Tours: Only $55/person plus half off for kids on the lunch or dinner whale watching cruise. Tlaloc Cabo: A 33 foot private sailboat with sunset cruises and whale watching tours. TransCabo: Four tour options, from $39/person in Cabo San Lucas bay to $209 in Magdalena Bay. Weather was cool for the first part of the week but got very nice by the end of the week. The waves were huge this week reaching the wall on several occasions. The unit was great and in great shape. Sad to see new hotel on the beach but that's progress. This will be a big city soon! Looking forward to coming in September and December! Dear Bob, All we can say is THANK YOU sooo much for a wonderful vacation in Cabo!!!!! The penthouse was lovely and very comfortable. The couplke that joined us are already talking about coming back with us next year! They has a great time also. We will definitely use you and your company for any further trips to Cabo and anywhere else you are involved with. We also will never use any other ground transportation other than TransPacifico. They are the BEST!!! Thanks again, Linda & Greg L.
Thank you so much for your recommendation of Villa Del Arco for our vacation destination. My family and I had a fabulous time! The accommodations were first class and it was truly a vacation of a lifetime. We particularly enjoyed the all-inclusive package and thank you for nudging me in that direction. It was worth every penny of the added cost. Thanks again for everything and we can't wait to come back. We had the most amazing time in Cabo, and the resort was much more than we imagined. It looks very nice on the internet, but to see it in person is so much more -- it was truly beautiful. The staff was so friendly and more than willing to assist us with any questions. We would also like to thank the two of you for all your patience and assistance throughout the planning of our vacation. You were so helpful and really put our minds at ease. We will definitely rent from you again on our next trip to Mexico.